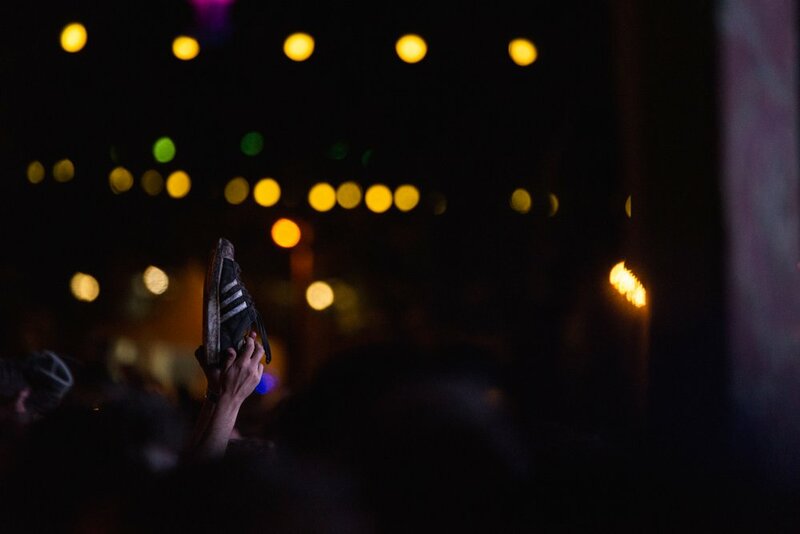 ‘The Boot’ has bemused many an artist on stage at Golden Plains. The look on their face when they see a sea of footwear held aloft above The Sup’… See, at the very first GP in 2007 a peculiar thing happened. The band Comets On Fire were, well on fire, and one gentleman in the audience held his white leather boot above his head in some sort of ultimate appreciation. Someone copied, then another and so on. So now at one or more times over the weekend, if the artist on stage is doing something that the audience is really, really digging, they get The Boot. By the hundred, or thousand. Find out all about it here. With thanks to FasterLouder and Sarah Smith. ….and here is some vision of that first Golden Plains and the origin of The Boot (with thanks to Rob McCafferty). Look for the white leather boot.